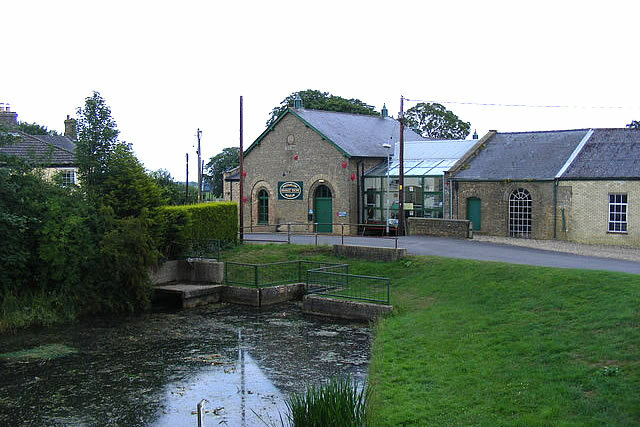 Prickwillow Museum, formerly known as the Prickwillow Drainage Engine Museum, tells the story of the changing face of the Fens and its network of drainage systems and pumping stations. The museum is housed in the old pumping station in Prickwillow, 4 miles east of the city of Ely in Cambridgeshire. The Fens are very low-lying compared with the chalk and limestone uplands that surround them – in most places no more than 10 m above sea level. Indeed, as a result of drainage and the subsequent shrinkage of the peat fens, many parts of the Fens now lie below mean sea level. Although one writer in the 17th century described the Fenland as entirely above sea level (in contrast to the Netherlands), the area now includes the lowest land in the United Kingdom, Holme Fen in Cambridgeshire. Within the Fens there are a few hills, which have historically been called "islands" as they remained dry when the low-lying fens around them were flooded. The largest of the fen-islands is the Isle of Ely, on which the cathedral city of Ely was built: its highest point is 39 m above mean sea level. Though some signs of Roman hydraulics survive, and there were also some medieval drainage works, land drainage was begun in earnest during the 1630s by the various investors who had contracts with King Charles I to do so. The leader of one of these syndicates was the Earl of Bedford, who employed Cornelius Vermuyden as engineer. The scheme was imposed despite huge opposition from locals who were losing their livelihoods based on fishing and wildfowling. Fenmen known as the Fen Tigers tried to sabotage the drainage efforts. Two cuts were made in the Cambridgeshire Fens to join the River Great Ouse to the sea at King's Lynn – the Old Bedford River and the New Bedford River, the latter being known also as the Hundred Foot Drain. Both cuts were named after the Fourth Earl of Bedford who, along with some gentlemen adventurers (venture capitalists), funded the construction and were rewarded with large grants of the resulting farmland. The work was directed by engineers from the Low Countries. Following this initial drainage, the Fens were still extremely susceptible to flooding, so windpumps were used to pump water away from affected areas. However, their success was short-lived. Once drained of water, the peat shrank, and the fields lowered further. The more effectively they were drained, the worse the problem became, and soon the fields were lower than the surrounding rivers. By the end of the 17th century, the land was under water once again. The major part of the draining of the Fens was effected in the late 18th and early 19th century, again involving fierce local rioting and sabotage of the works. The final success came in the 1820s when windpumps were replaced with powerful coal-powered steam engines, such as Stretham Old Engine, which were themselves replaced with diesel-powered pumps, such as those at Prickwillow Museum and, following World War II, the small electric stations that are still used today. The dead vegetation of the peat remained undecayed because it was deprived of air (the peat being anaerobic). When it was drained, the oxygen of the air reached it, since then the peat has been slowly oxidizing. This, together with the shrinkage on its initial drying and the removal of soil by the wind, has meant that much of the Fens lies below high tide level. As the highest parts of the drained fen are now only a few metres above mean sea level, only sizeable embankments of the rivers, and general flood defences, stop the land from being inundated. Nonetheless, these works are now much more effective than they were. The collection includes six large diesel pumping engines, all British-built and of early to mid twentieth century design, rescued from Fenland pumping stations. 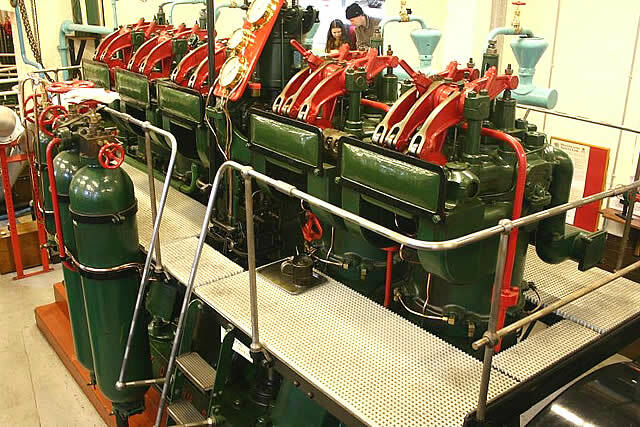 The Mirrlees engine is the original engine installed at Prickwillow pumping station in 1924. The large engines are complemented by a collection of small, portable, engines by Lister, Petter and other manufacturers. All the engines in the collection have been restored and are maintained by a team of volunteers. There is wheelchair access to the majority of the Museum. Assistance dogs are welcome. Tuesdays are usually work-days for the volunteer engineers so why not visit then to watch and talk to them! Transport: Ely (National Rail) then bus. Bus Routes : 129 stops very close by.